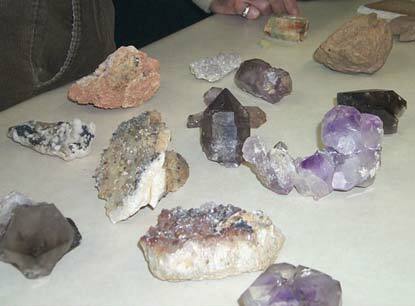 The next Athens Rock and Gem Club meeting will be on Tuesday, February 15th, 2011. We meet at Friendship Christian Church, located at 285 Tallassee Road, Athens GA. The church is located about 0.6 miles northwest of the Athens by-pass, on the left side of Tallassee Road. The business part of the meeting starts at 7:30 p.m. The educational part of the meeting begins at 8:00 p.m.
Our regularly scheduled program had to be postponed. A backup program will be presented by the Club President, Dr. James Maudsley and is entitled "A Surprise". 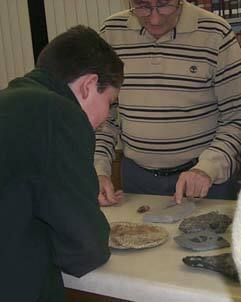 Unidentified rocks or minerals can be brought to this meeting for identification. Come join us! This will be a great meeting. The January meeting was a social event. 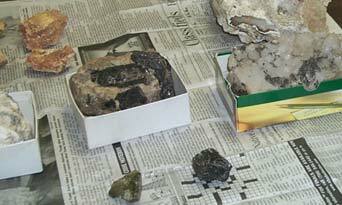 Members brought in items for a "Show and Tell". There were many "treasures" to share and stories told about how the items were acquired or made.